Seattle's One of the Safest Cities for Pedestrians. But are We Doing Enough? Critics say the city isn't acting quick enough to prevent pedestrian deaths. SDOT calls Rainier Avenue South "Seattle's most dangerous street." Two years after Seattle launched Vision Zero—an audacious plan to calm traffic, prioritize pedestrians, and reengineer city streets with the goal of zero pedestrian deaths by 2030—Seattle is safer for pedestrians than virtually any other U.S. city. It even stacks up well against Sweden, which is widely regarded as having the world’s safest roads. But some advocates say we could do better, pointing out that so far this year Seattle’s pedestrian death toll is moving in the wrong direction. In the first five months of 2017, three pedestrians have died in traffic collisions, and seven people have died in traffic overall—two more than the average for the previous three years. Defining “Seattle’s most dangerous street” is tricky business. 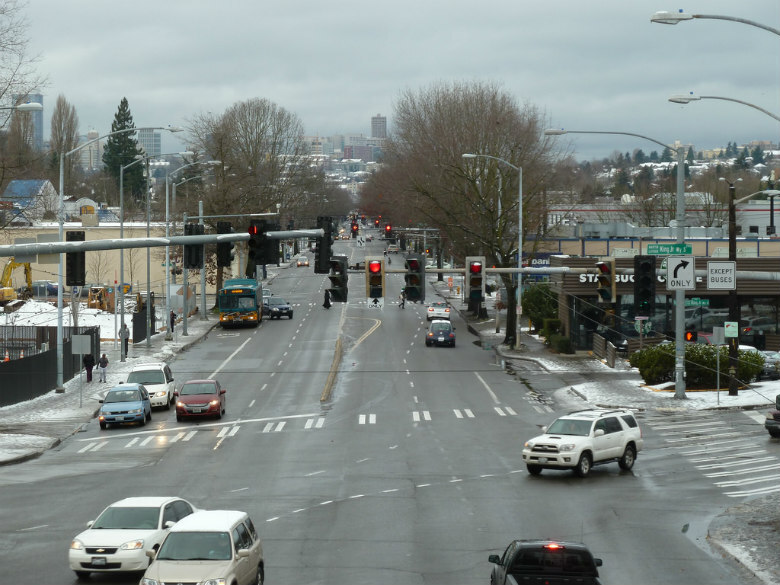 But the Seattle Department of Transportation (SDOT) uses the term generically to describe Rainier Avenue South, where a dozen people have been struck and killed over the last decade, and until recently there was an average of one collision a day. In 2015, SDOT found that the typical driver drove between 7 and 9 miles an hour over the 30 mph speed limit, and more than 12 percent of northbound traffic exceeded the limit by at least 10 miles per hour. That year, SDOT announced plans to calm Rainier traffic by removing one lane in each direction, adding crosswalks and other pedestrian improvements, and lowering the speed limit to 25 mph—which later became the default speed limit on arterial streets throughout the city. The two other most “crash-prone” streets for pedestrians, according to SDOT, include 35th Avenue Southwest and Southwest Roxbury Street, both in West Seattle. Pedestrian advocates would add to that list the intersection of Northeast 65th Street and Roosevelt Way Northeast, where two pedestrians have been killed by cars in the past year alone. “65th is not happening as fast as people would like,” Blaeloch says. “It’s a real challenge to get the city [to] speed up some of the investments on the streets that we know are unsafe by design. We’re not even studying safety improvements on those streets for three or four years, and then it takes two or four more years” to fix them. SDOT director Scott Kubly counters that the agency has started implementing some low-cost pedestrian safety measures where it knows pedestrian safety is an issue. But if the agency only acts in response to accidents, they’ll end up “chasing crashes” instead of predicting them. Seattle Neighborhood Greenways director Gordon Padelford says Vision Zero should be more than just aspirational. “No one would say, ‘We can have five deaths a year from our water system,’” he argues. “We expect to have all these other government systems that are completely safe.” Why should Seattle’s roads and sidewalks be any different?